Myers engineered wastewater products are known throughout the market for quality, value, innovation and reliability. Need a Myers wastewater product installation manual, parts list or brochure? Click on the below button to access the wastewater and pressure sewage systems library of documents. A market leader in the development and installation of grinder pump systems. 2 HP through 15 HP grinder pumps with lifts to 260 feet and flows to 190 GPM. Offered as complete turnkey systems or engineered to specification. Computer system design and selection programs available for design assistance. 3" discharge through 12" discharge with 2" to 5.25" solids handling. Lifts to 280 feet and flows to 8000 GPM. Computer system design and selection programs available. Custom designed controls and alarm panels. 3" through 12" guide rail lift-out packages. Junction boxes, both standard and explosion-proof. 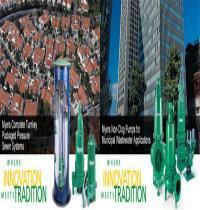 Myers, an industry leading complete turnkey company, providing engineered wastewater systems. Myers provides the most comprehensive personal engineered services available in the industry by assisting engineers, architects, developers and regional planners project assistance from the design inception through final product installation for their customized pressure sewer system. Myers Collection System Design (CSD) assistance provides the most complete hydraulic modeling service in the industry. Myers CSD program simplifies, assists and provides quick results to engineers designing collection systems. Engineer抯 topographical drawings can be incorporated into the CSD program. Myers Collection System Design service provides complete system detailed results including; flow capacities, head requirements, pipe size, pipe velocity, hydraulic grade and elevation, proper pump selection as well as pipe length and cost estimate. Myers offers these results in tabular form as well as illustrations on drawings provided to the Myers representative. Myers Collection System Design service can be utilized for all types of pumps including grinders, non-clogs, effluent and small solids handling pumps. We can also accommodate a mixture of pump brands to assure you of system compatibility.Upon design completion and approval, Myers will custom manufacture, test and ship on time the pump systems per your exact specifications. Myers experienced nationwide network of technicians and service centers handle system start-up and maintenance requirements to assure the collection system constantly operates at peak efficiencies. For more information, demonstration or complimentary copy of printed results of Myers Collection System Design (CSD) or Myers Automatic Pump Selection (MAPS) design assistance, Contact your local Myers distributor to discuss specific wastewater pumping requirements. to locate the nearest Myers distributor in your area.